My oldest son and I have been working together to develop valuations of potential stock picks. I designed a spreadsheet to estimate the per-share value of stocks, drawing on information I discussed in my article on stock analysis. It's far from perfect but the spreadsheet, combined with expert resources, has helped me to make good investment decisions. After some discussion about the rationale for my spreadsheet design and a few tips on finding the financial data, my son researched several stocks and determined their valuations. 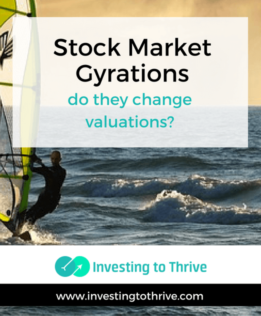 We discussed the results, noting securities that were undervalued (that is, their current share price was below its true value) and many that were overvalued (they had share prices above the value). Then he went back for his senior year in college, a few weeks passed, and the market fell dramatically. Next, I got an excited phone call and my investment-minded son asked me if a market decline meant an (automatic) change in stock valuations. This question took me aback. The whole point of the stock-analysis exercise was to determine the intrinsic value of the shares of certain stocks. What the market was doing on a particular day had nothing to do with true value, as I've learned from reading of The Intelligent Investor, which covers value investing and market gyrations. I felt frustrated that I hadn't taught him this basic principle. But then I realized that in a world of people going crazy, his question was a reasonable one to ask. Certainly, there could be exceptions. A market decline that reflects slower than expected economic growth could change valuations that are dependent on growth. But, in general, if I can calculate the intrinsic value of a stock accurately (that is determine the exact share price the stock is worth), the underlying value doesn't change just because its price fluctuates. An example might be helpful. Let's say that I determine the value of Stock ABC to be $50. At that time, the shares sell for $55, so I could say that the stock is overvalued. The company continues to thrive and generate income, income growth, and cash flow as expected for the next few months. But then the market (comprised of 500+ individual stocks) declines and the share price of Stock ABC falls to $40. Are the shares still worth $50? The simple answer is “yes.” The value doesn't change just because the market has a bad day. Now, and not to make things complicated, when (if ever) the shares will bounce back to $50 or even $55 is unknowable. But generally, their inherent worth remains. Using our Stock ABC as an example, its safety margin could be considered large at a price of $25; small at a price of $40; and nonexistent at $55. So, when the stock price of a fundamentally sound business goes down, the safety margin for the stock as an investment increases. Not only is a safer investment more attractive than a riskier one, there is greater opportunity for investment growth when I buy at lower prices.